In Colorado, 23 out of 64 counties have adopted Second Amendment Sanctuary resolutions, and others are considering implementing similar resolutions. 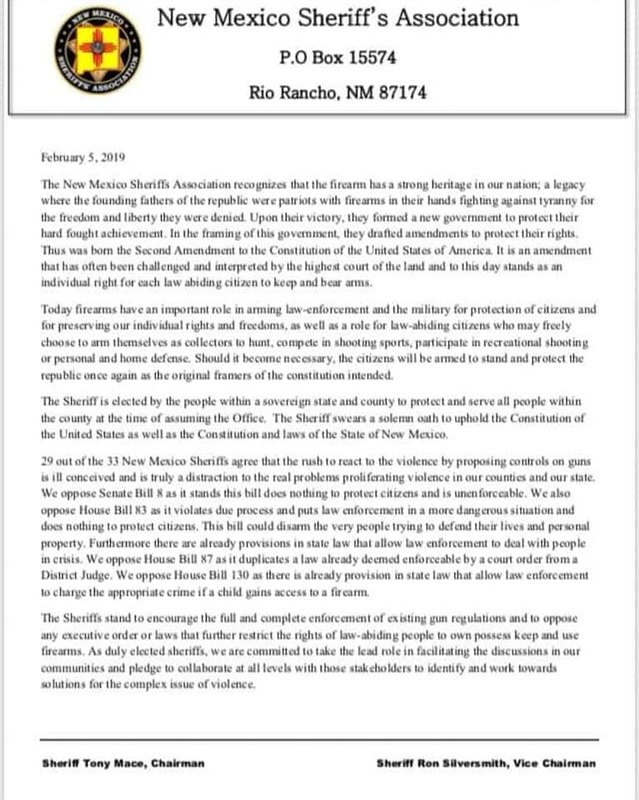 Legislators and sheriffs in the state are pushing back against House Bill 19-1177, a red flag bill that will likely become law soon. For a full analysis and critique of this bill, give this a read: Kopel and Greenlee: Plenty of red flags in Colorado’s ‘extreme risk’ protection order bill. Officially called Extreme Risk Protection Orders (ERPO), “red flag” laws permit police, healthcare providers, or family members to petition a state court to order the temporary removal of firearms from a person who may present a danger to others or themselves. Weld County recently joined the growing list of counties in Colorado that have passed Second Amendment Sanctuary resolutions in response to the impending red flag law. Reams added that one of the biggest problems with the law is it does not address actual mental health issues – it only allows for guns to be taken away, leaving the person in the same position and without medical help. To date, 63 out of 102 counties or municipalities in Illinois have adopted Second Amendment Sanctuary resolutions, and more are expected. To date, 3 out of 23 counties have adopted Second Amendment Sanctuary resolutions. Sheriffs in Nye County and Eureka County have said they oppose new gun laws in the state and will not enforce them. Nye County Sheriff Sharon Wehrly and Sheriff Jesse Watts of Eureka County both wrote separate letters to Sisolak and Attorney General Aaron Ford expressing their opposition to the law. Elko County may soon join Nye and Eureka – commissioners there plan to vote on a resolution to become a Second Amendment sanctuary county at a meeting on March 20. After the NY SAFE Act was passed in 2013, some New York counties passed resolutions in opposition. There are currently 52 out of 62 counties with such resolutions, and the New York State Sheriffs Association sued to block the law. Cherokee County passed the three-page resolution with a slim 3-2 vote, after resolution author Dan Eichenbaum told fellow commissioners that the “first thing dictators do is confiscate guns,” reported the Cherokee Scout. Organizers in Oregon plan to put even more defiant “sanctuary ordinance” measures on county ballots in 2020 that will direct their officials to resist state gun laws. In late January, the state of Washington made the news when several sheriffs in the state publicly vowed not to enforce the new unconstitutional gun laws that were passed in November. As of February 2019, the sheriffs of more than a dozen of the state’s 39 counties have publicly stated they will not enforce the law, though some said they will only refuse to do so until the final adjudication of pending lawsuits against the legislation. There are even 3 sanctuary STATES. Three states have passed bills to protect 2A rights at the state level. It declares that guns and ammunition possessed by Alaskans are exempt from federal gun laws. It also subjects federal agents to felony charges if they try to enforce any future federal ban on semi-automatic weapons or ammunition or enforce any new federal requirement for gun registration. Republicans said they are willing to let the courts sort out the issues. They said that they must stand up for Second Amendment gun rights and won’t bow down to the federal government on this. A number said they heard from constituents who back the bill. On March 14, 2014, Idaho Governor Butch Otter signed a bill prohibiting state enforcement of any future federal act relating to personal firearms, firearm accessories, or ammunition – effectively nullifying future federal gun laws. In conjunction with Section 6a (quoted above), the bill defines what is meant by “the second amendment to the constitution of the United States,” and that it isn’t based off a decision of the supreme court. What do you think about Second Amendment Sanctuary resolutions? Do you believe they will protect the rights of gun owners? Or, do you think the government will ultimately find ways to confiscate guns anyway? Share your thoughts in the comments below. Dagny Taggart is the pseudonym of an experienced journalist who needs to maintain anonymity to keep her job in the public eye. Dagny is non-partisan and aims to expose the half-truths, misrepresentations, and blatant lies of the MSM.